One day after structural concerns were raised about a city arena, the roof came crashing down Tuesday afternoon. Nobody was injured by the roof collapse at Fairview Arena, according to EMS, which responded to the scene along with the Calgary Fire Department and Calgary police. The roof collapsed shortly after 4:30 p.m. according to a police spokesperson. 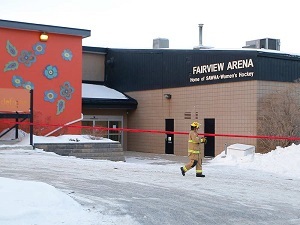 The arena had been closed since Monday due to “structural issues,” according to Leslie Ann Kalman, a director for the Fairview Women’s Hockey Arena Society and the Southern Alberta Women’s Hockey Association, which maintains operations of the facility. “I understand that there was a snapping sound heard (Monday) and a crack was observed in a roof truss,” said Coun. Gian-Carlo Carra, whose ward is home to the facility. Kalman said the arena had been evacuated since Monday and nobody was inside when the roof collapsed. The city’s building services department deemed the building unsafe after surveying it Monday along with engineers and representatives from the Calgary Fire Department, according to CFD spokeswoman Carol Henke. Henke said it was still unsafe for fire crews to enter the building as of Tuesday evening, as they instead continued surveying it from above. Kalman declined to comment on what might have caused the roof to collapse, instead directing questions to the city. The City of Calgary declined to comment.